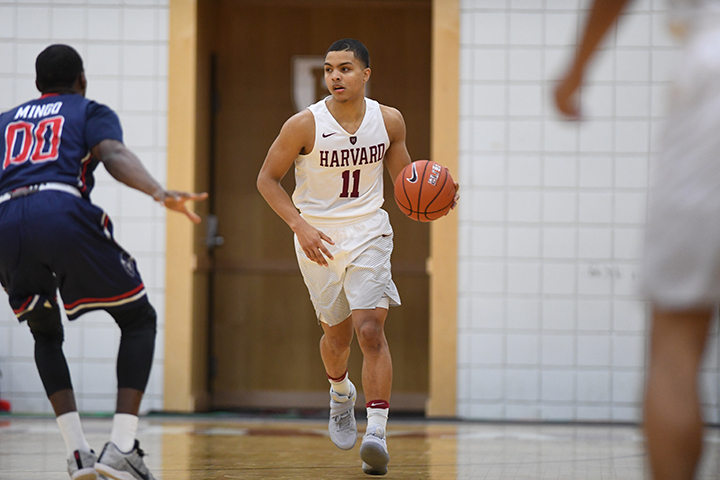 Bryce Aiken '20 (shown here in a December matchup with Howard) is Harvard's leading scorer; he is averaging 13.6 points per game. Last November, the Harvard men’s basketball team travelled more than 7,000 miles for a week-long trip to Shanghai. The trek featured visits to historic sites as well as a matchup with Stanford, and for at least one Harvard player, it was the first time traveling abroad. Over the last month, the Crimson has discovered a better rhythm, capturing six of seven contests, the most recent of which was Saturday’s 74-58 victory over Dartmouth in Hanover. Buoyed by an offensive dynamo in freshman point guard Bryce Aiken and an improving defense, the Crimson (7-5 overall, 1-0 Ivy) appear to be rounding into form as they shift their focus to Ivy League play. Since Amaker’s arrival in Cambridge in 2007, the Crimson has had no shortage of superb point guards. Brandyn Curry ’13 (’14), a southpaw, excelled at perimeter defense, and senior Siyani Chambers—a three-time all-conference honoree who leads this year’s team in assists—may go down as the best floor general in program history. Significantly, Aiken’s prolific production is coming in the flow of the team’s offense. Amaker primarily employs a motion offense—an approach that hinges on multiple players touching the ball during each possession and which historically has been most effective when the team boasts a balanced offensive attack. Having a single player like Aiken who is extremely effective at creating his own shot—but also benefits from having the ball in his hands—has the potential to disrupt the team’s flow. The coaches have therefore worked with Aiken to navigate what Amaker described as a “fine line.” “I need for him to feel like he has freedom,” the coach explained, “but yet he still has to have some accountability.” That both Aiken and the Crimson have thrived of late shows that Aiken has found that vital balance. Oswald Cross, a youth basketball coach in New York City who coached Aiken with the grassroots basketball program Team Scan (now the PSA Cardinals), has also been impressed by his rapid maturation as a college player. Cross, who is now a program coordinator at New Heights Youth, a youth basketball and education non-profit in Harlem, often exchanges text messages with Aiken after games and said in an interview last week that the freshman guard expressed disappointment after several of the team’s early-season losses. Now, Aiken is grasping that the setbacks can contribute to the team’s development and that what matters most is the team’s body of work at the end of the season. While Aiken’s offense has provided a spark, Harvard’s defense has been inconsistent. In an 82-71 setback at Vermont, the team struggled to prevent the Catamounts from driving into the lane—and Harvard gave up 15 offensive rebounds, an alarming result given the size and strength of the team’s front line. But the defense was far stouter in the trip to Hanover just five days later. The Crimson blocked five shots. The team also forced 17 turnovers (while giving the ball away just nine times), a sign that its pressuring man-to-man defense had the desired disruptive effect. The Crimson will hope to have defensive performances like that more regularly. Doing so depends on the freshmen continuing to internalize Amaker’s approach and avoiding mental lapses—such as letting poor offensive play interfere with their defense (a problem that, as Amaker observed, afflicted Seth Towns ’20 in Harvard’s victory over Howard). There are encouraging signs that the freshmen are making progress on defense. Late in the first half against Vermont, for example, Chambers hit a three and drew a foul to draw the Crimson within one. Rather than celebrate the dramatic shot, Justin Bassey ’20 told his teammates that they needed to get one more stop before halftime. Another encouraging sign is that the coaching staff has shown a willingness to tinker, resorting to a match-up zone defense more frequently. 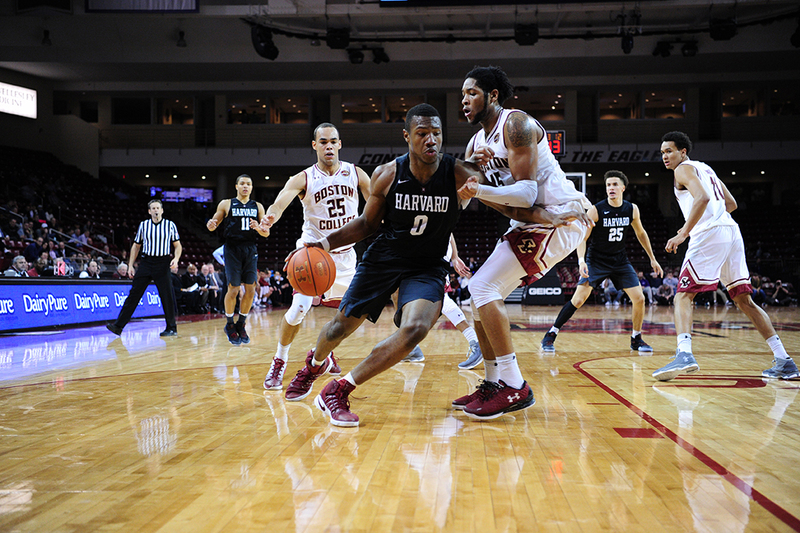 In prior seasons, Amaker has typically only employed the matchup zone (which combines elements of man-to-man and zone defense, where players are responsible for guarding a certain portion of the floor) for a possession or two each game, typically in an effort to surprise opponents. This year, the Crimson has gone so far as to deploy the match-up zone for a lengthy stretch at the end of the win over Howard. That suggested a technique Harvard might use more in league play. A zone prioritizes teamwork: a good strategy when a team lacks an elite perimeter defender—as is the case with this edition of the Crimson. It can also help to reduce defensive fouls, and so may be helpful given the team’s freshmen players. The strong defense in Hanover, the freshmen’s emphasis on improvement, and the coaching staff’s willingness to adapt schemes point toward continued progress. The defense points to a broader theme: the team is going through a maturation and learning process that may last throughout the regular season. Fortunately, Harvard has time on its side. In past years, the regular-season Ivy champion received an automatic bid to the NCAA tournament. But this year’s automatic bid will go to the winner of the inaugural Ivy League Tournament at the Palestra in Philadelphia in March. Harvard needs to play well enough to qualify for the tournament (the top four teams in the league get bids)—and above all, it has to continue to improve so that it can play its best basketball in March. The women’s basketball team also defeated Dartmouth on Saturday in a 70-65 home win that pushed Harvard’s record to 12-1 overall and 1-0 in the Ivy League. The Crimson was led by Madeline Raster ’19, who scored 17 points, and Taylor Rooks ’18 and Katie Benzan ’20, who added 12 points apiece. The victory gave Harvard its twelfth-straight win, tied for the longest streak in the last 10 years. The men’s team will complete non-conference play at home with a game against McGill on Tuesday before traveling to Bryant University the following week. The women’s team will head to LaSalle University for its final non-conference game on Wednesday and then travel to Dartmouth for a rematch with the Big Green on Saturday, January 21. Harvard Hardwood will return later this month with a more detailed account of the women’s season to date.